You'll be £6.00 closer to your next £10.00 credit when you purchase Hitler's Last Witness. What's this? After being seriously wounded in the 1939 Polish campaign, Rochus Misch was invited to join Hitler's SS-bodyguard. There he served until the war's end as Hitler’s bodyguard, courier, orderly and finally as Chief of Communications. Hitler’s Last Witness was a text I was very interested in both reading and reviewing especially in light of the exploration of possible escapes from the Berlin bunker complex now being aired on television. The book by Rochus Misch was no disappointment, it is a fantastic read both for a historian or merely the general enthusiast of the period. It is a very good look from a primary source well located to make remarks and notes on the coming and goings from the command headquarters of the Third Reich. It is well written and makes for riveting reading and not too lengthy at 254 pages but packed with detail and good photographs. The value and importance of this work I feel is too document various periods within the conduct of the war from the center of the German command, and place them in context with subsequent accounts. Rochus receives some stiff words from noted historian Roger Moorhouse on his stated bias and prejudices which I thought were somewhat standard for his period and feel any post war apologize or mitigations unnecessary in regards to his story and foundation; which was to rely the facts as he saw and recorded them versus owning any responsibility for the results or individual service during that time. Which would have lessen in my opinion the value of the book and Misch’s account. I would highly recommend the book as a very telling expose on the period and a well detailed look at how the inner circle of Germany in the war conducted themselves. I found the detailed section on Rudolf Hess and his flight to Scotland very interesting as well as the entire late war period where the pressure built up while the Soviet Red Army closes in on Berlin. The individual work of the co-authors really shines in this release and gives the material a solid flow and readability. For its size it is a stellar read of a period in which there remains a great deal of fog. It does a very good job in telling the final chapter of a regime in its death throes. Rochus Misch account provides great worth of detail in the people and circumstances of the late war period. It is well worth the price and will continue to serve as a first rate reference of Hitler’s final days. As featured on Elite Daily. These are the long awaited recollections of a man seen on international television for over a decade regarding his eyewitness testimony of all things in the last days of the Nazi regime. And the wait is well worth it too, as this fine you-are-there work puts the reader right in the centre of events, just as they transpired. Misch - who served with Hitler as an SS bodyguard during 1940-45, and telephone switchboard operator during the fabled final days - tells his tale in such an honest and straightforward fashion that one readily accepts many versions of things he witnessed. While most narratives and other biographical accounts focus on Hitler as German warlord, Nazi Party leader, and tyrant who unleashed indefensible suffering and death on the world, Misch’s autobiography provides insight on Hitler “behind closed doors.” While this is a provocative yet disturbing account, it is an important addition to the historiography of the last days of the Third Reich. This is a great book, showcasing a very intimate part of history, and presented very well. Well worth checking out for anyone interested in Hitler's personal life, or the internal workings of the Third Reich. Reading a first hand account of this time in history was fascinating! It was intriguing to see one man's point of view and the things he experienced. The author does not cast judgements or give assumptions as fact like most authors do. He writes about what he saw & heard during his time as an SS soldier. The story flows smoothly and gives a personal view of events during this time. Rochus Misch's memoir is a thoroughly readable, informative and frequently fascinating insider's account of various events during and aspects of a momentous period of history, by a man who - with a very few others - was privileged to witness much that was historic, cataclysmic, sometimes bizarre, and finally nihilistic, but whose rank and position meant that he always lacked the opportunity, access or personal desire to influence that which he heard or observed. This is a book that was worth writing and, when compared to the many other books about Hitler and his way of life, adds to the pool of knowledge. Excellent view from within the Third Reich, perhaps Misch is naive about the regime! But his view and opinion is tempered by the fact that massacres were not conducted in the halls of the Reichs Chancellary. It's a must read due to his fly on the wall status within the bunker in the last days of the what can only be described as hell on earth. 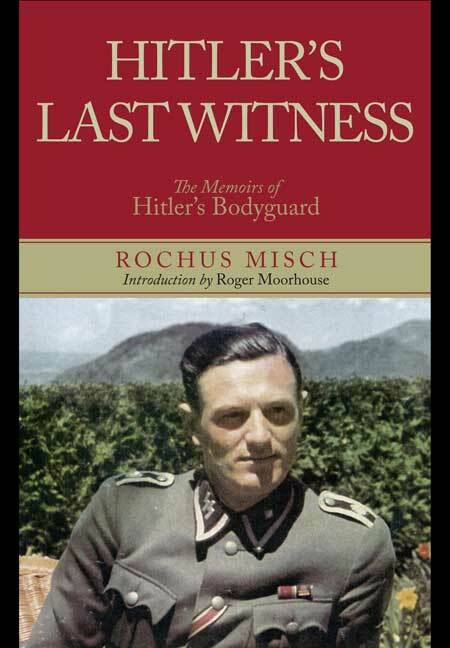 Born in 1917 ROCHUS MISCH was recruited into Hitler’s SS-bodyguard in 1940. He served as a bodyguard, courier and telephonist for five years. After Hitler’s death he was held in Russian captivity for nine years. He died in 2013. ROGER MOORHOUSE is the author of Killing Hitler and Berlin at War.